I love soup in the fall, it's one of my favorite things to eat. 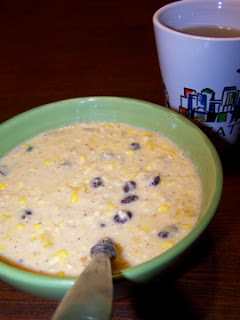 My friend Wendi gave me the recipe for her fantastic chicken corn chowder, well I futzed with it a bit as I am known to do and turned it into a vegetarian chowder. I make this chowder in one large skillet. It will serve 6 and also freezes well for future dinners. Cook onion in skillet with a splash of olive oil once translucent add garlic. While onion is cooking place 2 cups of corn in the blender and puree. Pour puree corn in the skillet and repeat the puree process so that you have 4 cups of pureed corn. Add all of the other ingredients except the cheddar cheese and cook on low for about 20 minutes. Add the cheese and once it melts remove chowder from heat source and serve.